This Cable is in very good condition and performing exactly as it should. Arrows are clearly marked on the connectors to ensure superior sound quality. AUDIOQUEST THUNDER / HIGH CURRENT. All insulation between two or more conductors is also a dielectric whose properties will affect the integrity of the signal. AUDIOQUEST NGR-2 DA 1,8 MT. Noise-Dissipation System No. SIAMO RIVENDITORI AUTORIZZATI. UK: 3-Pole Wall Plug to IEC. EU: 2-Pole Wall Plug to IEC. 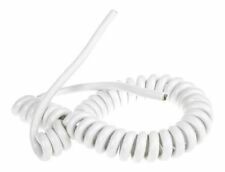 PRO-JECT CONNECT IT POWER CABLE 16A. Corrente max 16A. Nessuna degradazione sonora. • 16 Ampere maximum continuous power surge. • C19 high current connector. AUDIOQUEST TORNADO SOURCE EU. Jacket Black/Carbon Braid. 72V Dielectric Bias System. These products will require greater RMS and transient current capacity. AUDIOQUEST HURRICANE SOURCE EU. AUDIOQUEST HURRICANE SOURCE EUSPECIFICS. Optimized For Source Components. Low-Z / Noise-Dissipation 3-Pole AC Power Cable. THENDER 25-284. Cavo OFC (2,5 mmq) assemblato con. Cavo OFC (Oxygen Free Copper) (2,5 mmq) (25-025). connettori Schuko IEC in Oro. assemblato con connettori SCHUKO (25-050 G) e IEC (25-100 G). La spina pressofusa e i contatti placcati oro 24 carati garantiscono una lu. Produttore: OEHLBACH. DIRITTO DI RECESSO. MPN: 4003635170458. Mains Cables R Us No.11 Power Lead (2M) Upgrades: Furutech FI-11(G) MK Tough. Condition is Excellent/ Used. Retail £85 Dispatched with Royal Mail 1st Class. These products will require greater RMS and transient current capacity. 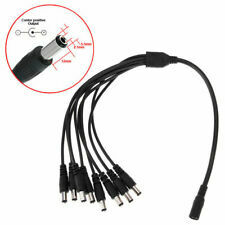 When applicable, arrows are clearly marked on the connectors to ensure superior sound quality. AUDIOQUEST HURRICANE HIGH CURRENT EU. AUDIOQUEST TORNADO SOURCE EU. Black / Carbon Braid Jacket. 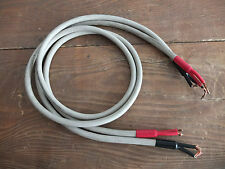 End off reel Acoustic Revive Powerstandard 8800 triple C power cable. Much improved sound quality over the older PCOCC-A version. Structure: 3-cores. In vendita cavo power Faber's Cable SX-SOLUTION lungo 1,8mt/6ft., perfette condizioni estetiche e soniche. for sale cable power Faber's Cable SX-SOLUTION long 1,8mt/6ft., perfect condition aesthetic and sonic. What's the difference between MusicCord and MusicCord-PRO, you ask?. The look and feel at once conveys a "jewel" quality and an aura of indestructablilty. unleashes your sound! It affords a signifcant expansion of your component's overall performance envelope. The issue is that even when these variables are kept in a reasonable balance, the way the conductors talk to each other may be varied in ways that greatly affect the sound of the signal being transmitted through it. La spina pressofusa e i contatti placcati oro 24 carati garantiscono una lu. Produttore: OEHLBACH. Colore: White. DIRITTO DI RECESSO. MPN: 4003635170441. Reinstes Kupfer made in Japan. Abschirmung: 16x7-adriges Kupferlitzengeflecht. Stecker Rhodium plattiert. Biete High-End Furukawa Stromkabel mit P037E / C037 Steckern. Aderendhülsen Kupfer vergoldet. Leiter: 3x14 AWG (2,5mm²) Leiter aus hochreinem Kupfer. A, lungo 1,5mt/5ft, ha 2 bullets ( 1 argento / 1 grigio ) per modificare il suono secondo il proprio gusto. Synergistic Research G07 AC Wall Plugs and IEC Plugs. Prese a muro di ricerca sinergica G07 CA e spine IEC. Alcasa 1550-SO015 1.5m CEE7/16 C7 coupler Black power cable - power cables (1.5 m, Male/Female, CEE7/16, C7 coupler, 250, Black). Produttore: Alcasa. Colore: Black. DIRITTO DI RECESSO. MPN: 1550-SO015. (Van den Hul Mainserver Power Cable. 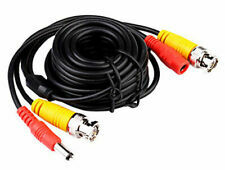 Van den Hul Optocoupler Mk2 MkII Optical Cable 1.0m Toslink to Toslink lucyella1(843). Black Rhodium Stream Power Cable (IEC 15 to UK Mains) 1.7m. reactance ) is absent and the cable therefore does not exhibit any current limiting, resonance or sluggish response to current demand effects. Material: OFC ( Oxygen-Free Copper ). Resistance value: 8.45km. 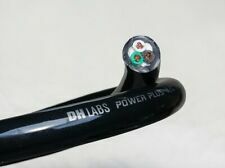 Here we have yet another super value for money Purefonics Powercable. 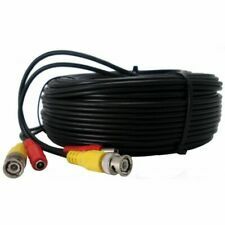 This cable is made up using the excellent Lapp cable and the fitted with GENUINE Oyaide C/Pe -029 plugs, (Hence the price) and the fitted with attractive sleeving. Atlas Eos 2mm Schuko to IEC 16A C19 1.5m Mains cable. Features a Rhodium UK 13A mains plug to 16A IEC connector. 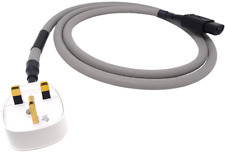 Atlas 'Eos 2mm' Mains Power cable. -We are quick! BLACK Rhodium Stream Power Cavo di alimentazione (1.7m). SCHUKO-IEC. EX-display. You are looking at an ex-display Black Rhodium Stream mains power cable. A further increase in the distance between conductors is achieved by use of the attractive cable braid and this further reduces ‘Proximity Effect’ distortion. 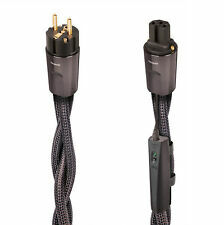 Monster Cable Power Line 2 Lautsprecherkabel 150cm TOP !!! Reinschauen !!! Tellurium Q Ultra Blue U.K. Power Cable (1.5m). Brand-new. Worldwide shipping. 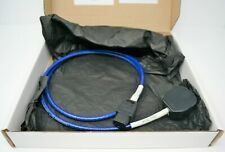 MINT CONDITION GUTWIRE PURE CUBE 3 HI-END MAINS POWER CABLE(1.85 METERS)AMAZING. Convergent Design Flying Leads to Neutrik Odyssey Power Cable - 36"
Pro Power 100M Flat Speaker Cable High Performance HiFi - Runs under Carpet!